This post originally appeared at democracynow.org. The War at Home, a landmark documentary about antiwar protests in the 1960s and ’70s in Madison, Wisconsin, has just been re-released nationwide. In an extended interview, we revisit the film with co-director Glenn Silber, two-time Academy Award nominee, and discuss why he argues now is an important time to revisit the responsibility to stand up and say no to war. AMY GOODMAN: Michael Moore tweeted this is ”THE film about resistance.” Let’s go to the trailer of The War at Home. BLAKE KELLOGG: Ken, why do you plan to burn your personal check in front of the Internal Revenue Service building here in Madison this morning. KEN KNUDSON: Well, I would like to protest against the income tax system because of where most of the money goes. 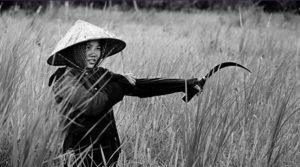 Ten percent is earmarked especially for Vietnam, which I consider to be an immoral war. AMY GOODMAN: The trailer for The War at Home. And for those who are just listening on audio, it’s the images of mass protest and the images of war and bombing in Vietnam. To talk more about the film and its contemporary significance, we’re joined by one of the film’s directors, Glenn Silber, two-time Academy Award nominee. Glenn, it’s great to have you in studio. You made this film back in 1979, and now you’ve brought it back. Talk about the significance and why you focused on one town, on one city—Madison, Wisconsin. GLENN SILBER: Well, co-director Barry Alexander Brown and I had lived through this experience. I was there as a college student from 1968 through ’72. AMY GOODMAN: At the University of Wisconsin. GLENN SILBER: At the University of Wisconsin. Barry had actually gone to high school there. And for me at least, having experienced that very intense antiwar movement that changed my life, I really felt we had lived through a story that had to be preserved. It had to be put on film, because I think that’s the best way; there’s no book that you can read about the antiwar movement that will give you the same sense of that 10-year experience in Madison. AMY GOODMAN: Well, let’s go to the Dow demonstration. AMY GOODMAN: Let’s go to what this is. It’s October 18, 1967. GLENN SILBER: Yes. I think the Dow demonstration, at least in Madison, and probably elsewhere, is one of the most important demonstrations ever, because what was it? The university invited the makers of napalm, that horrible weapon of war, that really should have been outlawed, to begin with, as a crime, this gel that burns people to death. They invited them on the campus so they could recruit more future napalm makers. And I think it’s important because in the University of Wisconsin, the antiwar movement was very focused on this. It became a real moral issue. And there was two years of organizing just around that issue. So when Dow Chemical came over to the community, this college, the students were ready, and they said, “We’re going to block you.” It was kind of, what we say, when the movement moved from protest to resistance. Up to that point, all the protests were kind of passive resistance, taking our cues from the civil rights movement. But with Dow, they drew a line, and they weren’t going to be quite as easy to go. And this time they also met some repression they never saw before. AMY GOODMAN: A clip of The War at Home. HENRY HASLACH: It was clear that the university was going to protect Dow. The plan was that people were going to go up to the Commerce Building again and sit down and be carried off—another nonviolent demonstration. MARGERY TABANKIN: The people at that time’s consciousness about the war was at a stage of conscious active resistance. There was a straight determination to resist being removed from that building, if the police entered. PROTESTERS: [singing] We will not be moved. MAYOR PAUL SOGLIN: All they did was come in, four or five at a time, with clubs swinging, and just beat the hell out everybody in that camp as they just swept down the corridor. MARGERY TABANKIN: Everybody sort of then just ran for it. RALPH HANSON: So, after this initial impact here, then we were able to accomplish the objective of clearing the corridor area. But the problem then transferred itself from within the building to outside of the building. MAYOR PAUL SOGLIN: The whole place was like a war zone. The critical moment was, a crowd began to gather because classes were just over, when the cops moved in. They started using tear gas. And it’s something like 4,000, 5,000 kids who were being affected by this thing. Well, suddenly all these fine middle-class kids at the University of Wisconsin are being tear-gassed and clubbed. And, I mean, I don’t know if it’s a time shock or what, but there was an awful lot of politicalization that took place in that 15, 20 minutes when the cops just let go with everything they had. AMY GOODMAN: A clip from The War at Home about the Dow Chemical protest October 18, 1967, at the University of Wisconsin. So, Glenn Silber, talk about this moment and the university calling in the police and what this meant. GLENN SILBER: Well, it was a real turning point in the antiwar movement in Madison. And actually, that week was a real turning point nationally, because it was the same week that, later on, they confronted the Pentagon, and there was a conflict like this. AMY GOODMAN: —of Archbishop Óscar Romero, who has now become a saint. GLENN SILBER: Canonized, yeah. So, anyway, so everyone was primed. This had been the results of two years of organizing. And one of the lessons I get out of looking at The War at Home today is that there is a relationship between the smaller core of people that are the most dedicated organizers and then how, in this case, it can affect 5,000 people, because of the overreaction of the police. So this became a rallying cry. I didn’t get to Madison until one year later, but, you know, you could still feel it. It was still resonating, and it had really changed the character. It wasn’t like we’re going to be that nice. We’re not going to run around and, you know, throw rocks yet, but it’s going to be a more resistance. And I think when you look back at this whole period we’re talking about, what’s important to talk about for today is that we really—the antiwar movement, at its base, is an 8-year sustained political resistance campaign, with one goal in mind. It was very focused: stop the war. And I have to say, last week we learned that General Westmoreland, without our knowledge, was planning to move nuclear weapons into Vietnam. And the fact that Johnson, who was about ready to declare he wouldn’t even run, wouldn’t do it shows you that the antiwar movement had more power than even we knew at the time. So I feel like by bringing the film back today, there’s so much you can learn about our recent past. And I think the political culture that came out of that period is still—it’s with us today. It’s what allows us to have these incredible manifestations or these demonstrations of the women’s marches or even Occupy Wall Street or the “Never Again” gun violence. So I feel like by bringing the story of this one town, Madison, Wisconsin, and the 8-year struggle, that we felt personally was our responsibility to stand up and say no to that war, is really one that would be well advised to revisit. And that’s why we decided to bring the film back right now. And so, we’re going to be playing it around the country. NERMEEN SHAIKH: Well, let’s show more of that story in Madison, Wisconsin. NERMEEN SHAIKH: Another clip from the film The War at Home. We’ll hear from renowned Beat Generation poet and countercultural activist Allen Ginsberg. But first, the chief inspector of the Madison police, Herman Thomas. HERMAN THOMAS: It’s no secret that the police were called pigs. And we didn’t mind that so much. So, when we began the undercover operations, I decided to name our officers that worked undercover after breeds of hogs. And it worked out very, very well. They would sign their reports by a pig’s name, like Duroc, Palouse, Peccary, Poland China. ALLEN GINSBERG: The FBI, around 1968, a year later, instituted a grand master plan to confuse and disrupt the youth movement and the New Left. And I have here a copy of their master plan of July 5th, 1968, which is a 12-point program to be undemocratic, basically, for the secret police to disrupt public conversation. HERMAN THOMAS: The sheriff’s department had people working undercover. The university protection security had people working undercover. So did Department of Justice. The FBI had someone. And even military intelligence was in the streets. And we gelled all of it together. NERMEEN SHAIKH: So, that was the chief inspector of the Madison police, Herman Thomas, and, before that, of course, renowned poet, who wrote, of course, the canonical poem Howl, talking about, of course, being very heavily involved in the antiwar protests. And he had just received documents about COINTELPRO. Can you—in that moment where he’s speaking. GLENN SILBER: Well, the funny thing is, Allen was in town for a poetry reading. And I’m actually a very distant relative of his. So I tepidly went to him after this reading and said, “Hey, you were here in 1966 for the big be-in.” And we wanted to go back to that spot. And we had a whole scene we had to cut, because it was too long. AMY GOODMAN: And explain what the be-in was. GLENN SILBER: The be-in was like a hippie thing where it’s like peace and love, in 1966. And he was chanting, and he had incense going. And all these people were dancing. It was just really lovely, but it was too long, so we cut that scene. And he said, “Well, listen, I’ve got something I want to tell you about.” And it’s this new documents that have come out about the government’s COINTELPRO, a sort of repressive undermining the antiwar movement through all these techniques they had to make them look ridiculous and ridiculed. And so he read that, and that’s what made it into the film. And I think it’s important because we were obviously, in Madison, Wisconsin, as well as elsewhere, becoming a bit of a threat to their war plans, so much so that they had to do this sort of insidious, you know, anti-democratic behavior. And I think one of the things, looking back—you know, when you’re so close in the middle of a movement, sometimes it’s really hard to get a perspective on it, and you don’t even see how some of these events are perfectly connected. But now that we’re, you know, almost 50 years away from when we—the things he’s talking about, you can really step back and have a better appreciation. When we were making the film, we were very young. I was in my twenties the entire time, as was my partner. And we really felt at the time, this was our story. And people said, “Oh, it’s too soon to tell the story of the antiwar movement, you know? You’ve got to wait another 20, 30 years to figure it out.” And we said, “No, actually, we don’t want someone else to tell our story. This is going to be a fight for the historical memory of that period.” And that’s what’s so important. I mean, this is really the only film—there’s another film about Berkeley, but they talk about many other issues. The War at Home stands. And the amazing thing to me, because I’ve seen it so many times when we originally released it, is it plays different now. It plays stronger now. Obviously it’s because we’re in this zeitgeist where everyone I know wants to be part of the resistance. And so, I went from being very depressed about the election and in a kind of a funk like a lot of us were, and then very kind of inspired by the women’s marches, that really picked me up. Then I started asking myself, “What can I do? What can I contribute to the resistance?” And the answer came pretty quickly. AMY GOODMAN: And talk about—when you say it came pretty quickly, it came in a number of boxes—where you got this archival footage. AMY GOODMAN: I mean, you have these cameras, clearly, right in the police officers’ faces—not the interviews you do after, but when they’re beating up the students. GLENN SILBER: Right, right. Well, that’s actually quite an amazing story, because I had decided and committed personally I’m going to make this film somehow. I was not even 25 years old, and I’m nobody. And I started going to collect photos. And is there audio? What’s there? And I went every week to the Historical Society, Wisconsin Historical Society. They had very little. But, of course, it was pretty close to these events. And then, one day, the head of the society, a film and photo part, said, “Silber, get over here. I think this might be your lucky day.” I said, “OK. I’m ready for some luck.” He says, “We just got a collection in from WKOW.” It’s Wisconsin. And it’s all the footage that was shot from 1959 to 1972, on a daily basis—you know, car crash on I-90, a dairy association convention, 30 students holding pickets. And so, for the local news people, this was a curiosity, these protests. We hadn’t had something like that before. There had been a little civil rights stuff, but not like this with our own students. And so, this one news director, Blake Kellogg, who, by the way, just passed away last week at 88, had the historical perspective and understanding that what he had done was important. He didn’t want it thrown out. But they had been storing all this material in a shed. And when my friend from the Historical Society picked it up, it was such a mess. I mean, it was ridiculous. It was like boxes and boxes and boxes. And you didn’t hear Barry’s story, because when we got it in, he said, “If you will catalog it, if you’ll clean it, fix the splices, tell us what’s there, we’ll let you have it for free.” Like a sweat equity deal. GLENN SILBER: Right. WISC and WMTV, they gave equal amounts. So, all of a sudden we had like a hundred boxes of films. No one knew what it was about. And I had this deal with the Historical Society. So, now, this is really, I’m pretty sure, the first film, documentary film, ever that is almost exclusively—the visual element of it and a lot of the archive comes from local TV news, as opposed to—and we have Army footage and other things like that. AMY GOODMAN: And speaking of Army, let’s go to another clip from The War at Home, which features the Vietnam vets, the men who came home, like Ron Carbon and Al Jenkins, who we hear from first. AL JENKINS: Yeah, we came back from the war, and the environment here was real hostile, especially to us. People in the peace movement were down on us, you know. People that were for the war were down on us. AMY GOODMAN: So, that’s Ron Carbon and Al Jenkins. 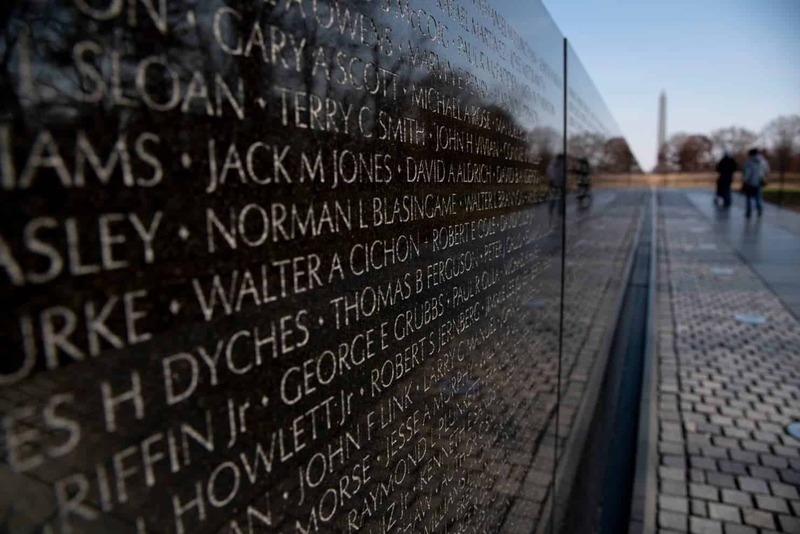 And talk about what happened then, the mix of the Vietnam War veterans, the atmosphere, the feeling toward soldiers who had come home, and the students. GLENN SILBER: Well, I think there’s a little bit of a myth, that I would like to try to clear up, this idea that protesters were spitting on GIs. I don’t think that has ever actually really happened. Or if it did, no one was recording it. 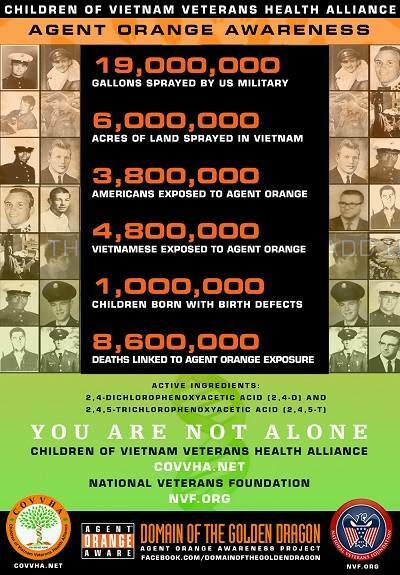 And, of course, when we talk about the war in Vietnam, it’s really, in my view, a criminal enterprise, when you think about carpet bombing, tens of millions of bombs being dropped, Agent Orange, napalm. But I never blamed the GIs who were sent over there and who were really on the front lines, not by choice, but because, you know, Johnson and McNamara and President Nixon were prosecuting a war. And it’s just shameful that we had to go through that and that they kept it going, you know, because of some anti-communist mentality from the ’50s, you know. 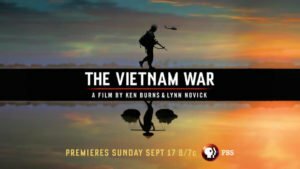 And Ken Burns did us a service by putting The Vietnam War series on television. And I was especially moved by seeing so many interviews with the Vietnamese. That’s the one thing we’d never seen before. But the one thing that he forgot to do anything about—and it is a glaring omission that everyone that I know who’s seen it has pointed out—is, in 18 hours of real estate on TV, he managed something under five minutes on the antiwar movement, with only one person representing us. That’s just wrong. AMY GOODMAN: Who was that? GLENN SILBER: Bill Zimmerman. Bill Zimmerman was involved as a student from Chicago in the civil rights movement, and he was a leader in the antiwar movement. And then he was very important during the Central America crisis. He started a group called Medical Aid for El Salvador, which we worked with very closely when I was doing that. So, I think that, you know, the story of the antiwar movement is not something you’re going to really be able to talk about in a book. I mean, you could talk about it, but young people today aren’t going to get it. And I think there’s been some criticism of our millennial generation for not getting it. But how can they get that information? And you have to appreciate that we’re as far now away from 1968 as we were in 1968 from World War I.
GLENN SILBER: Grok on that. AMY GOODMAN: Fifty years ago. AMY GOODMAN: I mean, that is a very, very big comment there that you just made. GLENN SILBER: Well, it is. AMY GOODMAN: In 1968, you go back 50 years, we’re talking about World War I.
GLENN SILBER: Right, right. But after ’68, the world started changing in many ways. I hate to be a cliché of Dickensian “the best of times and worst of times.” We won the culture war. OK? The product of the ’60s, more than anything, in my view, is feminism. I mean, and we’re still feeling those conflicts today, obviously. But what’s important to understand is, in 1968, look, we’ve been in dark political times before, and I think we have—the lesson of our film and the message of our film is, if we work together, if we get organized, if we know what’s the important things to focus on and if we’re smart, we’ll get through them. 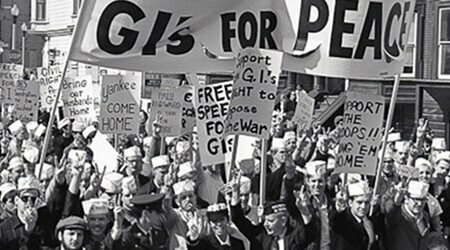 And I think the message of the film is also empowerment, that you see, from this very small beginning of the antiwar movement, in Madison, Wisconsin, one little town in the Midwest, to how that every step of the way is sort of brought out. GLENN SILBER: March 31st, 1968. AMY GOODMAN: And you have Richard Nixon saying he’s going to—the Republican candidate is going to end the war in Vietnam. Talk about the effect that had in ’68, when it was ultimately—you have Nixon against Humphrey. Of course, you have the protests at the DNC and all of that. AMY GOODMAN: —when he wins by an absolute landslide. GLENN SILBER: Well, that’s later. But, you know, Nixon campaigned in ’68—well, first of all, we had the Chicago convention, which I watched with my dad right before I was going to go out to college. And I was such a naive person. I was clueless, really, about the war, honestly, growing up in West Orange, New Jersey. And, you know, that was—I think that was the most politically divided we’ve been. People point back to ’68 and say that’s the year when the public lost faith in the government. That’s the year when we realized we were being lied to. And, you know, so, going back 50 years today, I think you can really draw a line from those conflicts, that polarization, and how you had this youth movement, that was the baby boom generation coming up, that—you know, the draft certainly played a big part for men. But what it really did was it focused your mind on what is going on in Vietnam. Believe me, if we had a draft during Iraq, people would have learned a lot more about Iraq, or these other conflicts we’re in now. So, I feel like the period of ’68 to the present moment is one where we need to learn from the period of the film, which is that, you know, we have power. We have a lot of power. We built a political culture that took pride in our democracy and was willing to defend it, in a way, because what they were doing in Vietnam was—you know, it’s a crime, really. And we have to learn from that period. And now, we don’t know exactly where things are going. OK? We know it’s not good. And the resistance, as it is, is something that has to stand up. It’s got to be more than the comics, the courts and the writers. Journalists are doing a great job. But I think everyone now—what the message of the film is, that we all have to stand up for what’s right. We can’t be cowed. We can’t—we’ve got to be smart. We can’t blow up buildings. We’re in a post-9/11 world, folks. You know, you’ve got to be really smart and be militantly nonviolent. AMY GOODMAN: —and what took place, certainly well documented in The War at Home. GLENN SILBER: Yes. That was another element of the story and of the history that is undeniable. For two years before what happened on October 24th, 1970, when four activists blew up the Army Math Research Center, SDS had three demands on the university. One was to stop complying with the Selective Service. One was something else. And one was about the Army Mathematics Research Center, which was this Army-funded facility. When you see the—when they inaugurated it, you see these generals there. They wanted to tap in to the brainpower of the university, using math to make their bombs more accurate, I guess. I don’t know all they were doing. But we know that they were doing classified research there. And so, all the demonstrations—I mean, you see people carrying coffins and putting them on the steps of this facility. You know, the university was just intransigent, like kind of the Dow demonstration. If they were going to have this kind of thing, why didn’t they just move it off campus so it wasn’t such an eyesore that we had to look at every day, as having the Army like implanted at our campus, when we were so progressively antiwar? So, eventually, all these warnings were given, and in the middle of night, at 3:42 in the morning, between semesters, these four protesters, called the New Year’s Gang, they called in a warning to the police and that protection and security: “Clear the building.” It was between semesters. And then we cut to this building being blown up. And it was a tragedy, because there was this guy in the basement—couldn’t see him—typing in his wife’s college paper to get out of town on vacation on October 24th, 1970. AMY GOODMAN: He was a what? Post-physics graduate student? GLENN SILBER: Yeah, 33-year-old physics graduate. But in the film, when we do interview Karleton Armstrong, he really apologizes in a way I never saw coming. He said, “I couldn’t justify it. It was the stupidest thing I could have done.” And I think that’s an important lesson also. AMY GOODMAN: And Robert Fassnacht, in fact, was opposed to the war. AMY GOODMAN: This physics post-grad. 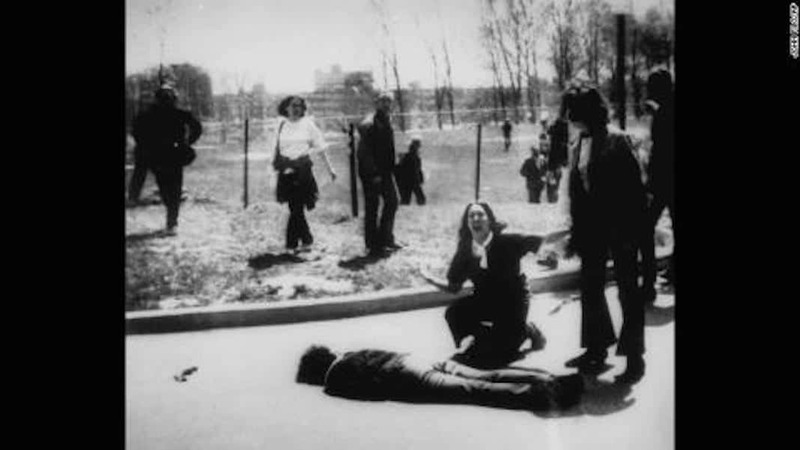 AMY GOODMAN: Kent State was May 4th, 1970. 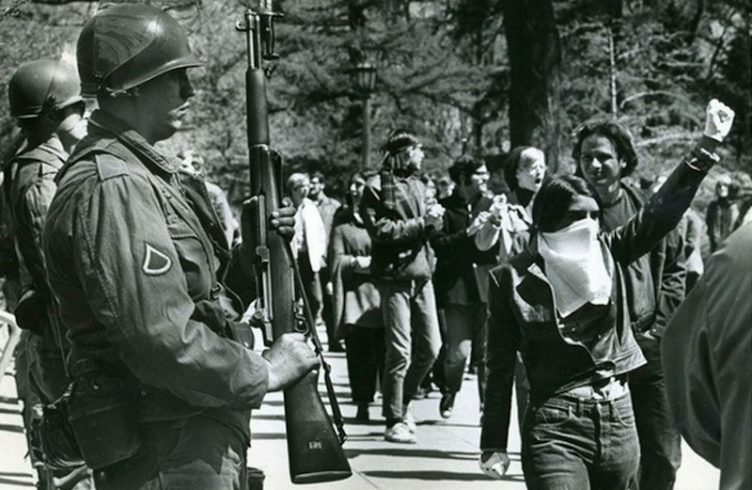 GLENN SILBER: May 4th, 1970, National Guard kill four unarmed protesters. And this is just an interesting story. You know, my buddy and I pull into Berkeley that morning, after driving all night to get there, and we pick up a hitchhiker, like we used to do. And the hitchhiker sees our license plate. And we hadn’t heard anything about the bombing. And he said, “Oh, are you guys from Wisconsin?” We said, “Yeah.” “Are you from Madison?” “Yeah.” And he said, “Put it there, pal. You guys are really taking care of business.” I said, “What are you talking about?” He says, “Didn’t you hear? They blew up that math building.” And I said, “Oh, my god.” And he was thinking like this was a fantastic thing. And then, an hour later, we found out there was an innocent victim who had died. You know, I don’t think you had to really—to defend Karl Armstrong, I don’t think you had to endorse the bombing. OK? And, in fact, what happened at the end with Karl Armstrong, if I can tell that story, is he went to jail. First of all, he made a deal with the court to plead guilty to second-degree murder—he was deeply remorseful—and get his 25-year sentence, if he was allowed to put the war on trial for two weeks in Madison. William Kunstler would manage this brilliant idea. And they had people like, you know, B-52 bombers, and they had Phil Berrigan, and they had Ernest Gruening, who’s in the film, who had voted against the Gulf of Tonkin, was coming to Madison from Alaska to stand up for Karl Armstrong. So, he had his chance, and it was the only time the war in Vietnam was ever put on trial in that sense. OK. So, Karl is in jail for eight years. GLENN SILBER: No, his brother, yes. GLENN SILBER: That’s how they got their name. On New Year’s Eve 1970, Karl mixed up one of these—he was working in a restaurant. He got one of these 20-gallon mayonnaise jars and made some kind of a homemade device he thought might go off. His younger brother, Dwight, had learned how to fly a plane. They hijacked a plane, and they flew over this major munitions maker in Wisconsin, about 40 miles outside of Madison. And they dropped a bomb on them. And they called it in to the press. And so, you know, you can imagine, if you’re a 20-year-old protester and you see this story, it’s like you don’t even know what to think. It’s like now we have an air force, and we’re dropping bombs on them? But what happened afterwards, so Karl goes to jail. GLENN SILBER: No, no. That went into a snowdrift. But he said he was trying—in the film, he talks about he was trying to help people’s imagination think about different ways of struggle. AMY GOODMAN: So, Karl goes to jail, as the others do. AMY GOODMAN: And Paul Soglin is? GLENN SILBER: Paul Soglin was the guy in the Dow protest who got beat up. And he later becomes a student leader and then a councilman, and now he’s the current mayor of Madison. He’s been an eight-term mayor. AMY GOODMAN: This is ’79. GLENN SILBER: ’79. And my partner and I—Barry said to me, as we were going out on stage before we showed it, he said, “If there’s any audience in the country that’s going to tar and feather us, it’s this one.” People are still so invested in that history that they just, you know, didn’t—they didn’t even think we’d ever finish it, or, if we did, it would be any good. And so, the film ends, and there’s like a moment of black before the credits come on. And it’s just this incredible explosion, like a lightning bolt hit the theater. And we were not prepared for it, honestly. So, but before that, the theater owner, Landmark Theatre Company, had implored us to invite the mayor and the entire City Council, as if it should be like a civic event. Well, that’s fine. I wasn’t really in favor of the council, but they told me they’re coming. Well, it was Friday, Saturday, Sunday, and the council meetings are on Tuesday. And some councilman I couldn’t have picked out of a lineup puts forward this resolution, which is being discussed for the following week, that Karl Armstrong, his brother Dwight, Leo Burt and David Fine should be pardoned for their actions, which is the most heinous crime in the history of Madison. AMY GOODMAN: And the city councilman who did this? And later on, Paul Soglin wrote an editorial in the paper called “All of Us,” which he echoes in the film, saying, “Look, whether he was right or wrong, this was a product of everything we did here. And so we can’t just say, ‘Well, you know, this guy’s a mad bomber.’” This was really, for years, the focus of our protests. And it’s now part of history. AMY GOODMAN: And so, what happened? GLENN SILBER: Oh, thank you. So what happened was, he put through the resolution. I was one of three people that was there with Karl’s mother, who was pleading for her son’s release, because at that point his father was dying of cancer. And the City Council, not one of our more liberal city councils, voted 13 to 8, not for a pardon, changing that word to “parole.” Karl had just been denied parole. We sent it to Robert Kastenmeier, our congressman, and Karl Armstrong walked out of jail six weeks later. And I was there to greet him. It was pretty amazing. You can’t make this stuff up. AMY GOODMAN: Well, Glenn Silber, we want to thank you so much for being with us. Now it is 40—almost 40 years later. You have a remastered this film. AMY GOODMAN: You’re here in New York at the Metrograph. AMY GOODMAN: Where else are you going? GLENN SILBER: Well, just in a nutshell, the film was an old 20th century 16-millimeter film, and we worked with a group here in town called IndieCollect, where they scan it at this super-duper 5K thing, which I don’t really understand. And then they put it out in 4K, and they color correct it for like a year. And so, because of that—the Metrograph is this great cinema downtown—they heard about it, and they sought me out, because the guy who owns it loves the film so much. He discovered it when he was like working in a video store when he was 19 or something. And so, then we got this opening here in New York. Well, first, the New York Film Festival invited it back. And they said some very nice things about it. And then, after that, we have the Metrograph. It went right down there, and it’s been held over for another week, folks. By the way, Paul Soglin is going to be coming down at some point to be with us. And then it’s opening in Detroit for a week. Then we go out to San Francisco and Berkeley for a week, on October 26th; into L.A. on November 2nd for a week. From there, we go up to Portland, Oregon, to the Living Room Cinema. And then, shortly after Thanksgiving, we’ll be in Chicago at a terrific—these are all A-plus cinema—arthouse cinemas. And really, we’re doing it to announce, folks, The War at Home is back, both literally and physically. And I think that now this is a perfect time to have this story out. I think anyone who comes to see the film will get a real foundation. It’s kind of a foundational film. I talked earlier about the political culture we built. This shows you every level of protest—what worked, what didn’t. And I think it will empower people to know. We’ve been in a dark political times before, but if we band together and get organized, we can win. We will win. AMY GOODMAN: Glenn Silber, two-time Academy Award nominee, director, with Barry Alexander Brown, of the Oscar-nominated documentary The War at Home, about the antiwar movement in Madison, Wisconsin, in the ’60s and ’70s, and actually about so much more. The film’s just been restored. It’s being re-released in theaters around the country. I’m Amy Goodman, with Nermeen Shaikh. Thanks so much for joining us.